Hiya guys! It's the start of a brand new week and I am back again with more from the lovely MTL Creations. I will actually be reviewing quite a few of their collections throughout the month, so get ready to see a lot from their store! Today I have swatches for the long awaited thermal collection that has been in the works for months. As you guys know I am a huge fan of thermals so I'm very excited about the collection. The Thermals by MTL Creations will be releasing today May 4th at 4PM EST. The entire collection will be available as a collection and individually in both mini and full size bottles. As a reminder, MTL Creations is based in Canada but does ship to the US. Bella Beretta is a shimmering thermal that is pastel pink when warm and transitions into a bright pink when cold. This is so adorably girly and fun - plus I love the name. I always have an affinity for dramatically noticeable transitions so this one does hit the mark in that regard. The formula applied well, but I did have a bit of visible pigment make my swatch (see ring nail). For these swatches I used three thin coats and sealed them in with Seche Vite. 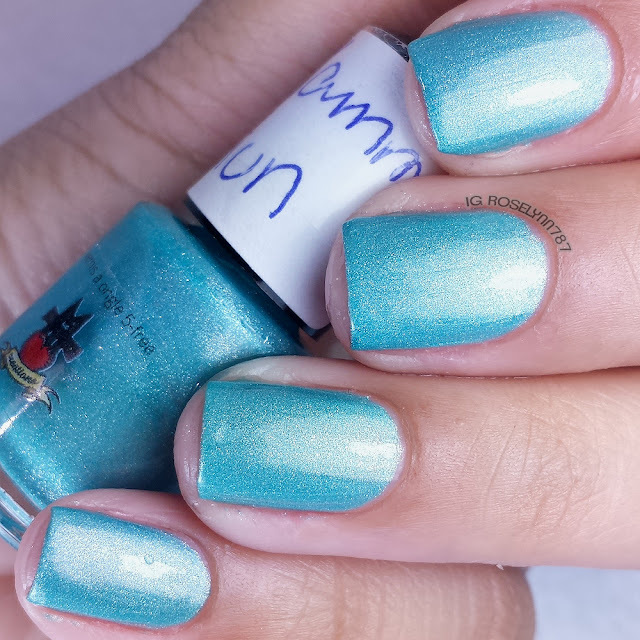 Tammy Gun is a shimmering thermal that is light teal when warm and transitions into a bright aqua when cold. Doesn't this feel very mermaid-ish? I love the transition, it's very noticeable and dramatic with the enhancement of the satin-shimmer finish. The formula applied well, but I did find the brush strokes to be a little noticeable due to the satin-like finish. However a nice thick layer of topcoat does well in smoothing out any crinkles. For these swatches I used three thin coats and sealed them in with Seche Vite. 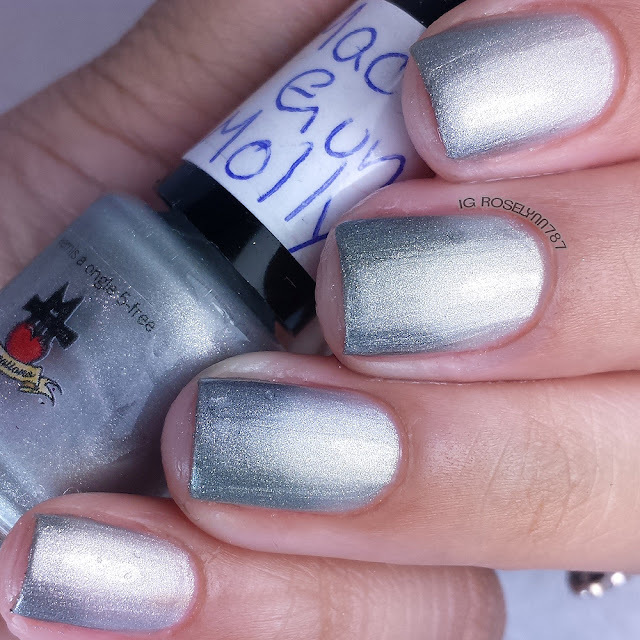 Machine Gun Molly is a shimmering thermal that is light silver when warm and transitions into a gun-smoke grey when cold. Unfortunately I will start by saying I am not a fan of the particular tones. I was really hoping I would end up loving this more than I did when I had it on. It doesn't necessarily mesh well with my skin tone, in my opinion. The formula applied decently, but the brush strokes are very visible and causes a streaky finish. 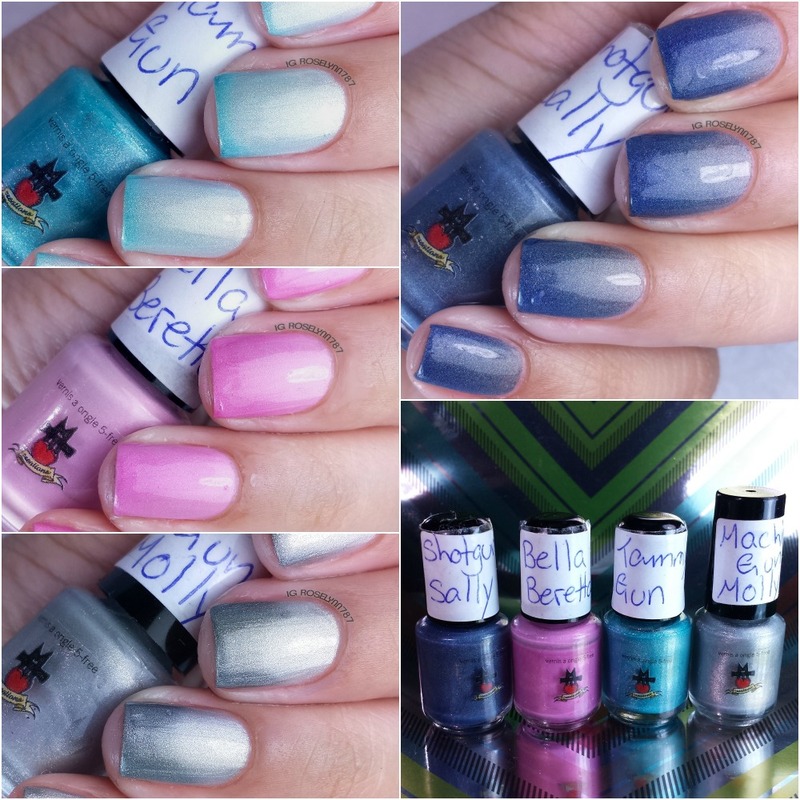 For these swatches I used three thin coats and sealed them in with Seche Vite. Shotgun Sally is a shimmering thermal that is light grey when warm and transitions into a dark blue when cold. Hands down my favorite among the entire collection! Definitely a must-have for anyone whose a fan of thermals. It transition between colors without any issues. Nice smooth formula and consistency, not too thin or too thick. The first layer was surprisingly opaque and the layers applied evenly throughout. For these swatches I used two thin coats and sealed them in with Seche Vite. Overall I am thrilled to finally see their release of thermals, but I wish the shades appealed to me more. Like in most collections there is a must-have though and that would clearly have to be Shotgun Sally. From the shades in the transition to the formula, this polish is downright gorgeous. I am also definitely excited for future thermals, which hopefully will include some unique transitions! As I mentioned before, The Thermals by MTL Creations will be releasing today May 4th at 4PM EST. The entire collection will be available as a collection and individually in both mini and full size bottles. Are you guys fans of thermals like me? If so, which one shown here was your favorite? thermals! swoon! I think my favorite is Bella Beretta. Haven't seen a baby pink thermal in awhile! Thanks! I wish I was more into pink so I could enjoy it. I LOVE thermals! Tammy Gun is my fave! Me too! Especially during the colder months. Ohhhhh! Tammy Gun and Bella Beretta look amazing! These are lovely!!! I need Machine Gun Molly!! I wish I could of liked Machine Gun Molly more, but I'm glad you like it so much! Not only color shades but also the bottles are adorable. The shades are great, but I'll be honest I'm not a fan of the mini bottles myself haha. Tammy Gun and Shotgun Sally are amazing!! I love the shift in these thermals, they look so pretty! Thanks. I'm glad most of the polishes have a huge transition shift. The transition of Tammy Gun is freaking gorgeous!! I agree! It's so dramatic and flawless. YAY thermals! I especially love the pink but these are all handsome. I really like thermals! The first two you showed are my favourite! Wow, shimmering thermals, gorgeous!!! The dark blue is my fave! I love how dramatic the shift is in these! I like Bella Baretta the best. These are lovely and your thermal photos are just perfection! Shotgun Sally really is gorgeous! I love that deep blue! And your transition shots are so great. Bella Beretta is my favourite! I love thermals! These are so pretty, I like Tammy Gun best! These look great. I really like thermal polish lately, especially ones with an obvious color shift. Tammy Gum is my favorite. So pretty! I agree - Shotgun Sally is awesome! Tammy Gun is freakin gorgeous!! !